Drama/Horror, USA, 1931, 72 min. Tagline All Paris desired her, but Svengali owned her! 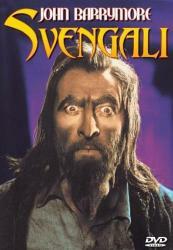 Synopsis Sinister music maestro Svengali can control the actions of women through hypnotism and his telepathic powers. When a pupil he has seduced announces she has left her husband for him, he uses his powers to cause her suicide and promptly forgets her. He meets a beautiful model, Trilby, and becomes infatuated with her, but she, in turn, falls for a young artist called Billee who also loves her. One day Svengali hypnotizes Trilby to cure her headache, but also examines her upper palate and decides it is an ideal cavity for great singing. He convinces her to fake her suicide, so Billee and friends will forget her, and goes on a singing tour with her. Svengali uses his powers to make her sing wonderfully and Madame Svengali, as Trilby is now known, becomes a sensation throughout Europe. But Billee discovers the ruse and begins to follow the pair, upsetting Svengali enough to have him cancel performances too frequently, so they no longer can perform in Europe. They go to Egypt, but Billee relentlessly follows.